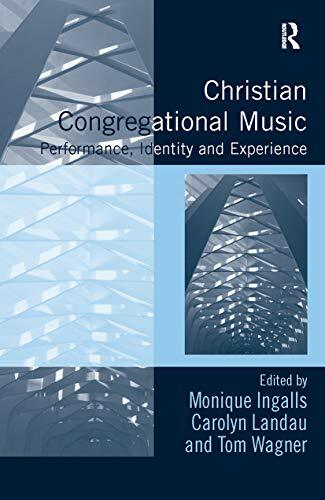 Christian Congregational Music explores the role of congregational music in Christian religious experience, examining how musicians and worshippers perform, identify with and experience belief through musical praxis. Contributors from a broad range of fields, including music studies, theology, literature, and cultural anthropology, present interdisciplinary perspectives on a variety of congregational musical styles - from African American gospel music, to evangelical praise and worship music, to Mennonite hymnody - within contemporary Europe and North America. In addressing the themes of performance, identity and experience, the volume explores several topics of interest to a broader humanities and social sciences readership, including the influence of globalization and mass mediation on congregational music style and performance; the use of congregational music to shape multifaceted identities; the role of mass mediated congregational music in shaping transnational communities; and the function of music in embodying and imparting religious belief and knowledge. In demonstrating the complex relationship between ’traditional’ and ’contemporary’ sounds and local and global identifications within the practice of congregational music, the plurality of approaches represented in this book, as well as the range of musical repertoires explored, aims to serve as a model for future congregational music scholarship.